Minimal: you will be awake and conscious. However, you will feel very relaxed and extremely calm. 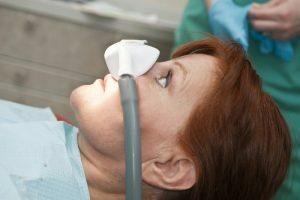 This ‘minimal’ level of sedation is achieved by using nitrous oxide, sometimes to referred to as ‘happy gas’, which is combined with oxygen, and delivered through a nose mask. Moderate: you are still conscious and able to respond and breathe on your own. However, you are in a deeper level of sedation or relaxation and will have little to no memory of the procedure. This type of sedation is most commonly administered orally or intravenously, and is referred to as ‘sleep dentistry’. Deep: you will be unconscious and asleep. This type of sedation is achieved through a general anaesthetic. After waking up from a general anaesthetic you will have no memory of the procedure. This is usually carried out in a hospital. A qualified anaesthetist (a medical doctor who has specialised training in anaesthetics) administers the drugs, controls the length of time you are asleep, and is present during the entire procedure to monitor your breathing, pulse and blood pressure. At dhealth Dentistry, our team of experts are more than qualified to administer ‘happy gas’ during your dental procedure. This can be particularly effective and helpful if you suffer from dental phobias or anxiety. We will administer a combination of nitrous oxide gas and oxygen through a nose mask. If you require deeper level of sedation or a general anaesthetic is required, then we are more than happy to provide you with the appropriate referral. It can be quite difficult to determine whether you need sleep dentistry, or if laughing gas will be sufficient enough to help you through your dental procedure. Luckily, that’s what the friendly dhealth Dentistry team is here for: you can ask us any questions at all. The level of sedation you require with will really depend on your individual needs and the procedure that is to be undertaken. So, make sure you discuss your treatment plan with your dentist—they are best placed to give you all the advice you need. Most people get by with no form of sedation for dental treatment. For people who get quite anxious and nervous during routine dental visits, ‘happy gas’ is usually sufficient and makes an otherwise tense dental visit a lot more relaxing and comfortable. A general anaesthetic, although undertaken with the utmost care and constant monitoring by an anaesthetist, does carry slightly more risk and possible side effects than happy gas. As such, general anaesthetics should only be undertaken if absolutely necessary. A dental general anaesthetic is most commonly undertaken for wisdom teeth removal, jaw surgery or for young children who need extensive dental work and cannot tolerate treatment in the dental chair. Appropriate referrals can be made to an oral surgeon or a paediatric dentist if this is required for you.